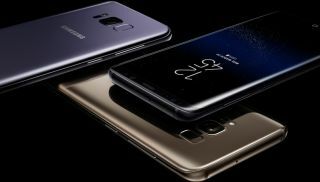 Samsung Galaxy S8 and S8+ are official | What Hi-Fi? Samsung's next flagship phone is finally here, and it doesn't disappoint, thanks to a bigger screen, better camera and headphones from AKG by Harman. Today Samsung finally took the wraps off the Galaxy S8 and S8+, two of the most eagerly-anticipated smartphones of the year. Here's why we're excited. The Galaxy S8 comes in two variants - the standard S8, and the S8+ which replaces the Edge models we've seen in recent years. Instead of a dedicated Edge variant, both phones feature the infinity display which was previously the preserve of the Edge model. Cosmetically, the only difference is size: the S8+ has a 6.2in screen, and the S8 5.8in. Both, then, are quite a bit bigger than their S7 counterparts. The Galaxy S8 comes in two variants - the standard S8, and the S8+ which replaces the Edge models we've seen in recent years. Instead of a dedicated Edge variant, both phones feature the infinity display which was previously the preserve of the Edge model. Cosmetically, the only difference is size: the S8+ has a 6.2in screen, and the S8 5.8in. Both, then, are quite a bit bigger than their S7 counterparts. The S8 also has a higher screen resolution of 2960 x 1440, giving it an aspect ratio of 18.5:9. That's nigh-on identical to the LG G6's. HDR comes as standard, just like the Sony Xperia XZ Premium. Headphones made by AKG will come bundled with both models. That's hardly surprising - AKG is owned by Harman, which Samsung bought late last year. Both the S8 and S8+ do have a headphone jack, contrary to rumours and indeed the latest iPhone. In terms of cameras, we're looking at a 12MP f/1.7 dual pixel rear camera with autofocus and optical image stabilisation. And the front? An 8MP f/1.7 autofocus snapper is the order of the day. Inside is a 10nm octa-core Exynos 64-bit chipset, including a 2.3GHz quad-core processor. That partners with 4GB of RAM. Both handsets are waterproof, have wireless charging, and iris-scanning tech that's been improved since the Galaxy Note 7. The S8 has a 3,000mAh battery, and the S8+ 3,500mAh. Samsung's own voice-activated personal assistant, Bixby, is on board to act like Siri or Google Assistant. And both phones can be the guts of a PC thanks to Samsung's DeX solution that sees you dock your handset and work on a keyboard and mouse plus monitor. Samsung has also announced its own virtual reality platform, which will launch with over 8,000 videos and 2,000 "premium experiences". The S8 and S8+ are available to pre-order now from Samsung's website, to ship on 20th April. Both go on general sale on 28th April. The S8 starts at £689 and the S8+ £779, and both are available in midnight black and orchid grey finishes.